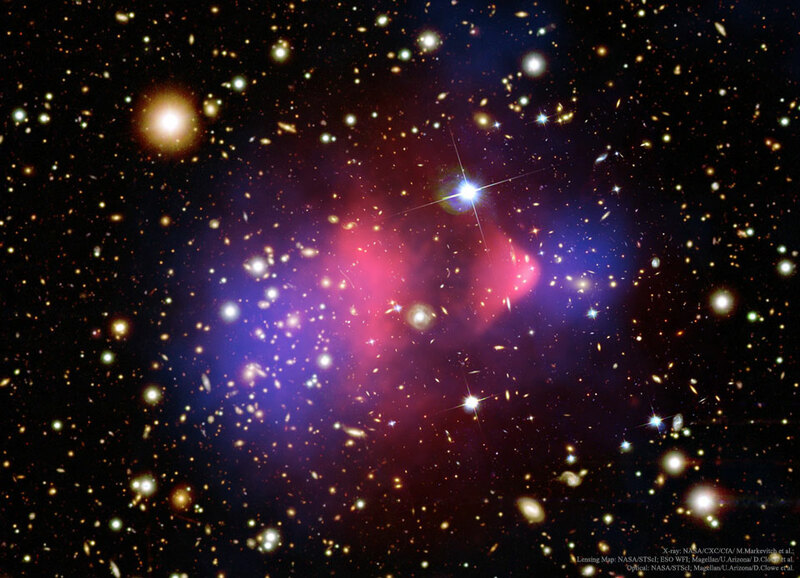 Explanation: What's the matter with the Bullet Cluster? This massive cluster of galaxies (1E 0657-558) creates gravitational lens distortions of background galaxies in a way that has been interpreted as strong evidence for the leading theory: that dark matter exists within. Different recent analyses, though, indicate that modifying gravity could explain cluster dynamics without dark matter, and provide a more likely progenitor scenario as well. Currently, the two scientific hypotheses are competing to explain the observations: it's invisible matter versus amended gravity. The duel is dramatic as a clear Bullet-proof example of dark matter would shatter the simplicity of modified gravity theories. For the near future, the battle over the Bullet cluster is likely to continue as new observations, computer simulations, and analyses are completed. The featured image is a Hubble/Chandra/Magellan composite with red depicting the X-rays emitted by hot gas, and blue depicting the suggested separated dark matter distribution.